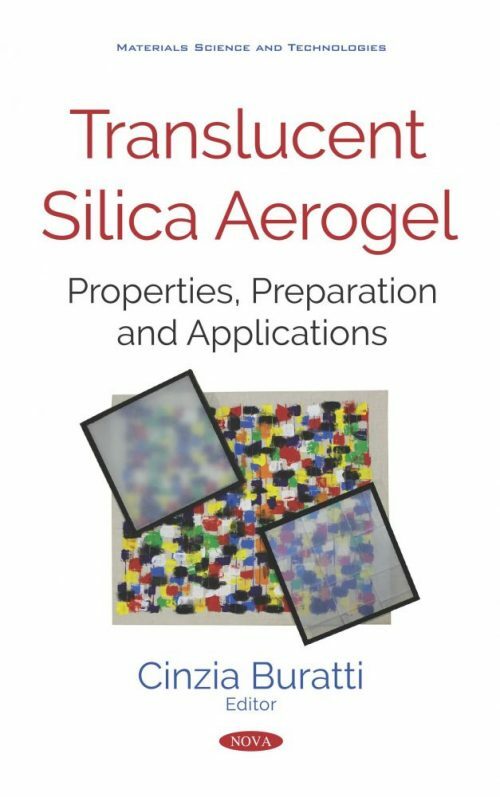 Silica translucent aerogels are unique materials able to improve the thermal insulation performance of buildings without compromising daylight transmission. The aim of the book is to give a general overview on state of the art research on translucent aerogels and their applications in buildings and to provide a data set about thermal and physical properties, useful in buildings’ energy performance simulation and design. Silica aerogels are nanostructured solid materials made of approximately 96% air and 4% silica. They show a thermal conductivity in the 0.012–0.020 W/mK range and excellent optical properties, especially visible transmission. They come in granular and monolithic form. Granular aerogels are relatively easy to produce and less expensive than monolithic panes, but show worse optical and thermal performance. Monolithic aerogels enable vision through the material, but their fabrication process is not developed at an industrial scale. Chapter 1 is the contribution from Union College, Schenectady (USA). The chapter reviews the chemical approaches to silica wet gels preparation, the drying methods used to yield monoliths, and the challenges and limitations associated with its production. Chapter 2 is a contribution from EMPA, Dübendorf (Switzerland). It is a review of current state of the art research on silica aerogel granulate production, including raw materials selection, hydrophobization strategies, and drying methodologies. Chapter 3 is a contribution from Takenaka Corporation, Tokyo (Japan). The main techniques for the optical properties evaluation are described and data are provided. An original application of translucent aerogels in buildings and future research topics are also proposed. Chapter 4 is a contribution from Recep Tayyip Erdogan University, Rize and Ataturk University, Erzurum (Turkey). A review of the thermal properties of aerogels is provided, highlighting their better performance when compared to conventional and superinsulation materials. Chapter 5 is a contribution from the University of Perugia, Perugia (Italy). The acoustic properties of both granular and monolithic systems are investigated. For example, the influence of granule size and layer thickness that is deepened for granular aerogels is discussed, while for the monolithic form, the little data that is currently available is reported on. Chapter 6 is a contribution from the University of Tuscia, Viterbo (Italy) and Buro Happold Ltd, London (UK). It is focused on Life Cycle Assessment of silica aerogel, showing the research challenges in understanding its environmental impact, lower than the one of conventional thermal insulating glazing systems. Chapter 7 is a contribution from the University of Lyon and INSA-Lyon, Lyon (France). An overview of measurement methods and modeling tools available in literature is provided and a summary of the main mechanical properties of both monolithic and granular aerogels is reported on. Chapter 8 is a contribution from the Norwegian University of Science and Technology, Trondheim and SINTEF, Trondheim (Norway). Authors present their experimental investigations on various aerogel systems in different building envelopes (new aerogel glass material, aerogel-incorporated concrete, and so forth). The book is aimed at engineers and professionals specialized in the field of energy saving and the development of new insulation materials for opaque and transparent envelope. It is also aimed at researchers in the field of innovative insulation materials, especially for the transparent buildings enevelope. It could also be of interest for people who want to deepen a current newsworthy such as reducing consumption and energy savings in buildings.